Heavenly Host is a 'Honeymoon Cabin' that is a great place for newlyweds and couples looking to escape. As you enter the authentic log cabin, you will find a fully equipped kitchen where you can prepare a candlelight dinner. To your left is a bathroom with an oversized shower. The main part of the cabin contains a Log Frame Queen bed, Jacuzzi for two, gas fireplace, HDTV and Blu-rayDVD player. Beautiful french doors open up to the very private back deck where a large Hot Tub is waiting for you to enjoy! Just 3 miles from downtown Gatlinburg and the Trolley route comes by right down the hill. Located close to the Gatlinburg Arts and Crafts Community. My wife and I have been married 30 years. We went on our honeymoon to Gatlinburg! We have two grown children and an 'empty nest child'...a Goldendoodle dog named Max. My wife teaches Kindergarten and I am a Regional Pastor. We lead mission teams to Guatemala as well. Gatlinburg has long been a favorite vacationing place for us! I have been coming to Gatlinburg since I was a child, we honeymooned here, and came here often when we were raising our kids. Several years ago, we had the opportunity to purchase this beautiful log cabin and our hope is that it will be a blessing to couples and families as they seek to renew their relationships, and enjoy some time away from the busyness of everyday life! 'Heavenly Host' is a great place to enjoy some 'getaway time' as a couple. Whether you are relaxing in the jacuzzi tub, preparing a candle light dinner in the full kitchen, snuggling up in front of the fire place, or enjoying the very private hot tub on the covered deck, there are many amenities to enjoy! The covered back deck also has a gas grill so you can grill some sizzling steaks rain or shine. The rocking chairs on the deck provide a private view of the wooded hillside. It's a great place to talk, listen to nature, or read and pray. After relaxing, there are plenty of activities nearby. 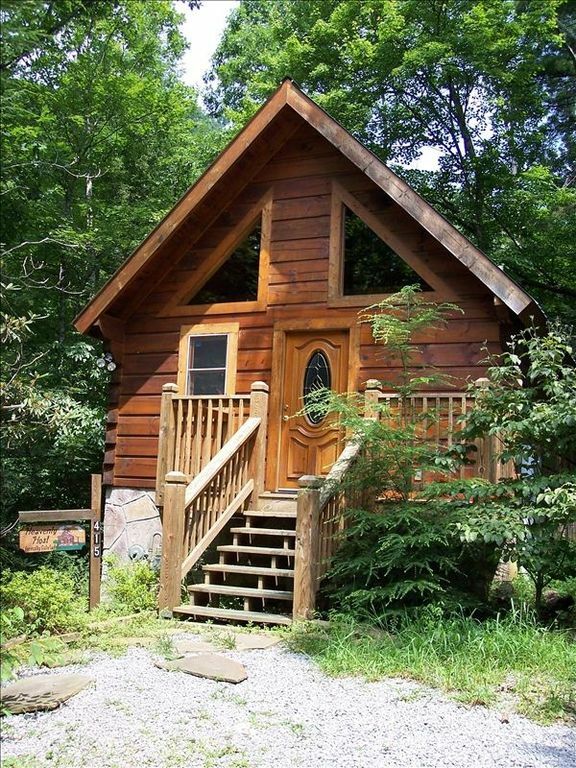 The cabin is located near the Arts and Crafts community and is only 3 miles from the heart of Gatlinburg with all its shopping, restaurants and entertainment. We were stressed and needed badly to get away. We forgot a lot of stuff because we were stressed but luckily the cabin had everything we needed and then some! We slept well and everything was spotless just the way I like it! The owner was very tentative to our questions and the hot tub when we couldnt figure out how to turn it off! Thanks for an awesome stay we feel refreshed and new! The view is also amazing the drive up is so scenic we had to drive slowly to take it all in! The cabin is secluded enough too that we felt alone even with other cabins near by! This was a first trip for my boyfriend and I and we could not have been more pleased. We are not the pickiest people in the world. We would rather spend our vacation touring the place than sitting on the couch people complain about below. The jacuzzi was great and the hot tub was even better. The studio cabin was PERFECT for a romantic get away. It was very secluded in the back which we loved. However, I would definitely just bring one car. Our only regret is that we did not book a longer vacation. The owners were very responsive and helpful even though I had an issue navigating this App. Overall, the amenities are very good if you are just looking for a place to kick back and relax & aren't concerned about location. We liked that it wasn't located as high as many other cabins in the area. Although the couch is rather uncomfortable, we enjoyed the quiet and the fireplace during what turned out to be some very rainy days.Getting enough hot water for the indoor tub was a challenge, but the outdoor hot tub was better (except for the cover). In general, it was a very nice, one-time stay sort of place. I had called prior to my arrival to stress the importance that everything needed to be in order as it was our honeymoon, was reassured that everything would be correct. Several light bulbs were out in bathroom, kitchen area and living area, six total. Lamp shades were cracked, bed side lamp worked half of the time. Behind the couch was very dirty, spare piece of wood and extra furnace filter. Cigarette burn in the couch which is way beyond wore out. Oven is missing paint in front and rusted, top of refrigerator is covered in dust. There is fake greenery and flowers on the walls that are long from fresh, very faded, droopy and dusty. Cabinet where extra blankets are kept was wide open upon arrival, the doors would not shut. The grill out side just needs to be threw away, just old and broken down like a cheap grill gets over time, more of an eye sore. There was hair clip under the bed. Jacuzzi tub inside would leak out of the handles, mirror behind was dirty has brown spots on it..Over all was not pleased with the cabin, you get what you pay for, so either pay more for a nicer well kept cabin or go to a motel for a better same rate room. I'm sorry the cabin did not meet your expectations. I'm sorry to hear that the lamp shades have been damaged. We were not aware of that. We will also have our maintenance staff take care of the light bulbs and double check some of the extra cleaning that needs taken care of. I also would like to point out that out of the last 12 reviews 10 of those we received 5 stars. One of those '5 star' reviews was from the guest that checked out the morning you checked in. I'm sorry we did not not meet your expectations but according to the rest of our guests that cabin is not in the shape you have portrayed. Nevertheless, we will make sure to have our cleaners review your concerns and take care of any issues. Great place to stay. One issue brought up in other reviews is the parking. Dont take a full size truck or you will be doing a 15 point turn to get turned around and headed out . The rain didnt stop until the day we left Nothing anybody could do about that. This kept us indoors. Along with a run to the grocery store and we were set. We will stay here again next time we are in the Gatlinburg area. Great having you with us! Hopefully, on your next stay the weather will be bring and sunny?